How it works: Drug companies pay the FDA a fee when they submit new products for approval, and those fees fund the review process. But the FDA can’t accept new fees or applications during the shutdown. FDA commissioner Scott Gottlieb said yesterday the agency has moved some money around and can keep the review process going for roughly another 5 weeks. What’s next: Several drugs could be left hanging in the balance if the FDA reaches the end of that 5-week "runway" and the government is still shut down, STAT reports. Most Americans think the U.S. health care system is pretty bad — but which Americans hold that view seems to depend on who’s in the White House. 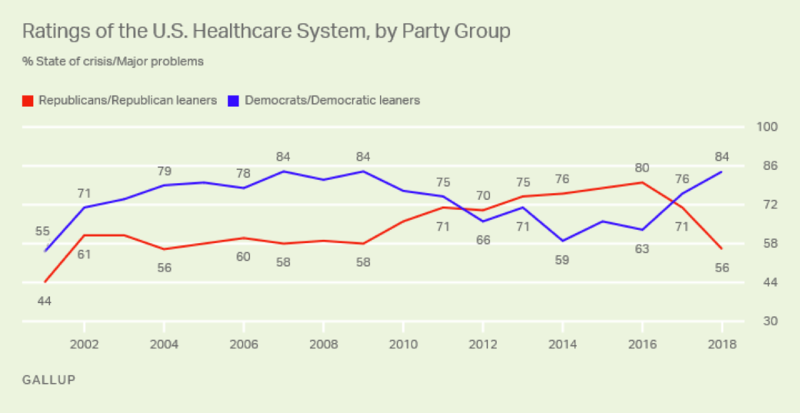 By the numbers: 70% of Americans say the health care system has serious problems or is in a “state of crisis,” according to a new Gallup poll, while just 30% say it’s not so bad. Those numbers have roughly held steady since 2001. But there are big partisan shifts over that period. During the George W. Bush administration, more Democrats said the system was in crisis. Under Barack Obama, Republicans were the ones panicking. Now, they’ve switched again — Republicans’ dissatisfaction is waning and Democrats’ is growing. Reality check: The U.S. has had worse health outcomes than other industrialized countries, and has paid more for those outcomes, this whole time. Democrats on the House oversight committee have kicked off an investigation into prescription drug prices, sending letters yesterday to 12 drug companies seeking information about the pricing of almost 20 specific products. The list includes some of the best-selling drugs in the world — Humira, Embrel and Revlimid — as well as insulin, whose staggering price hikes have stoked particular rage. Between the lines: These companies had to know this was coming the second they saw last November's election results, and they're savvy political operators with access to the best lobbyists money can buy. But over the next couple of months, President Trump will see coverage of congressional hearings on drug prices that, despite his demands, continued to rise and rise. How this will play out is unclear. But I think we're going to find out. Medicare would have saved an average of nearly $12 billion per year if it had the Department of Veterans Affairs' ability to negotiate directly with pharmaceutical companies, according to researchers writing in the journal JAMA Internal Medicine. And that's just for 50 drugs. Yes, but: Those savings would also require Medicare to say "no" to covering some drugs, Axios' Bob Herman notes — a shift from the current policy, in which Medicare pays for almost all FDA-approved medications. Details: Discounts on expensive brand-name drugs like Harvoni, Crestor and Xarelto would have led to large portions of the savings in the Medicare Part D program, according to the researchers. The analysis did not factor in injectable drugs like insulin, or drugs administered in hospitals and doctors' offices. The bottom line: There is a trade-off here. Medicare could save a lot of money by copying what the VA does, but Medicare would have to be willing to restrict access to some drugs.